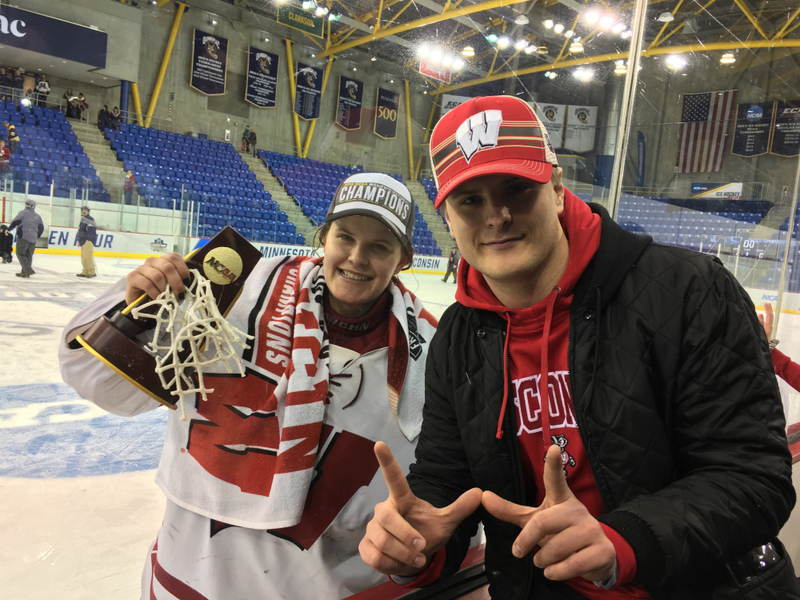 Wisconsin goaltender Kristen Campbell celebrates her 2019 NCAA Division I national championship on the glass with her brother, Kyle. There’s a saying that if you were to lay a two-by-four piece of lumber from the roof of one skyscraper to another, and tried to walk across it, you’d fall as soon as you looked down and saw the distance to the ground below you. But if you kept your eyes forward and looked straight ahead, out over the roof of the other building, you’d make it. This is, of course, nearly impossible to do. Most of us would look down immediately. We would succumb to the doubt and fear and holy-hell-this-is-a-dangerous-spot-to-be, and our eyes would be drawn right towards the ground. It takes an incredible amount of focus to ignore those doubts and fears, stare down your goal, and keep plugging along. Most of us will also never attempt to cross between two buildings by way of a two-by-four, hundreds of stories up. But we all have something we want to achieve. And we all have our own doubts and setbacks on our way to doing it. This is one of Kristen Campbell’s favorite metaphors. Like any hockey player worth knowing, Campbell has had shining moments to remember, and devastating moments she’d like to forget. Like any hockey story worth telling, this one is about winning, and losing, too, and how much we give to a game that doesn’t always give back what we want from it. When Campbell begins her college career at the University of North Dakota, she opts to redshirt her first year. She’s coming into college as a 17-year-old, and it’ll give her more time to develop and get acclimated to the level of play in the NCAA. She’s all in on this plan to make herself a better goaltender, but it’s not the same as playing games, and that’s a difficult adjustment to make. She does. She finishes her redshirt year and gets ready to push for the starting job in 2016-17. She gets chances in net, but North Dakota rolls with her goaltending partner, senior Lexie Shaw, for most of the season. It’s disappointing, but it just makes her even hungrier for next year. Her time at North Dakota comes to a close on March 29, 2017, while the team is on the ice preparing for the following season. Budget cuts are handed down to the Athletics Department from UND’s administration. By the time they get off the ice, the women’s hockey team does not exist at UND anymore. In the locker room after, people are sobbing. Campbell, too. Hearts are broken. Campbell’s, too. And you can’t shake the feeling that this isn’t how it was supposed to end. Saying that Kristen Campbell is a hard worker is sort of like saying the Grand Canyon is a hole in the ground. You’d technically be right, but anyone who goes to see it for themselves would know you’re lying through your teeth. She will do anything she can to be better on any given day. When she was redshirting in Grand Forks, she was on the ice taking shots as often as possible. She started vision training sessions, which she’s continued for the past four years. Nobody is in the weight room as often or as long as her. Nutrition is a big focus, too. Every meal she eats is carefully crafted to help her perform at her best as an elite athlete, or, as she so often puts it, to “fuel the bod”. It all stems from a desperate desire to be the best hockey player she can be. There is never a minute of the day she can’t use to make herself better. It’s a 24/7 effort. As Idalski puts it, she’s a 360-degree athlete; mentally, physically, on and off the ice, she is constantly pushing herself forward. 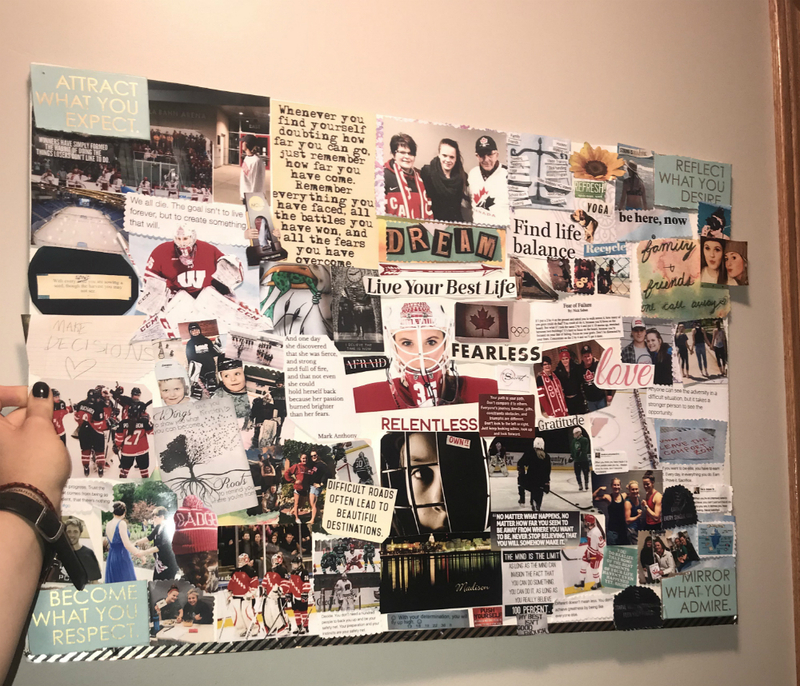 Campbell creates a vision board with motivational quotes, pictures, and memories as a constant reminder of where she’s been and where she wants to go. Campbell takes almost everything to the extreme; she’s got no notion of doing things halfway. This is why she’s so focused and intense about hockey, and also why she has a such a huge heart for her teammates, family, and friends. But it makes her more than a little haphazard in other areas of her life. When she was at UND and had a car at school, she probably set a record for parking tickets accumulated in a single year. Once, she accidentally filled her truck up with race car fuel, and had to sort out a gas bill in the hundreds of dollars. Other people might learn and grow in inches; Campbell has often done it in leaps and bounds. Anyone who knows Campbell is also probably familiar with running into her while she’s rushing to get some place she was supposed to be five minutes ago. She’ll give you a quick hello and a nervous laugh before telling you she has to finish printing a paper, get to class, meet someone for coffee, do a workout, cook dinner for some of her teammates, go to yoga, take a quiz, and pack for a road trip. (None of this will happen on time.) Your head might be spinning, wondering how she’ll get everything done before the sun comes up the next day. But where other people see exhaustion and room for error, Campbell sees only opportunity. It’s 2 a.m., the day after UND cuts its women’s hockey team. Amid the tears and pain and heartbreak, this utter sense of being without, Campbell is sitting up in her teammate’s apartment, scrolling through rosters on her computer. Campbell thrives off of having a plan. And the plan was always to work hard, become the best goaltender she could be, and help her team win a national championship. That would no longer be possible at UND. Campbell knows almost immediately that she’s going to Wisconsin for her sophomore year. Still, just because she had that belief and that dream doesn’t mean there was going to be a set plan again. She didn’t play many games at North Dakota, and she was joining a new team and coaching staff who hadn’t worked with her before. Nothing would be given to her; it would have to be earned all over again. “There was really no plan,” Campbell said. “It was just all about me and what I was going to do to create my own plan when I came here. I had an opportunity and I’m more thankful for that than anything. But there was no set plan. She does. She starts every game for the Badgers in 2017-18. She’s named an All-American and the WCHA’s goaltending champion. 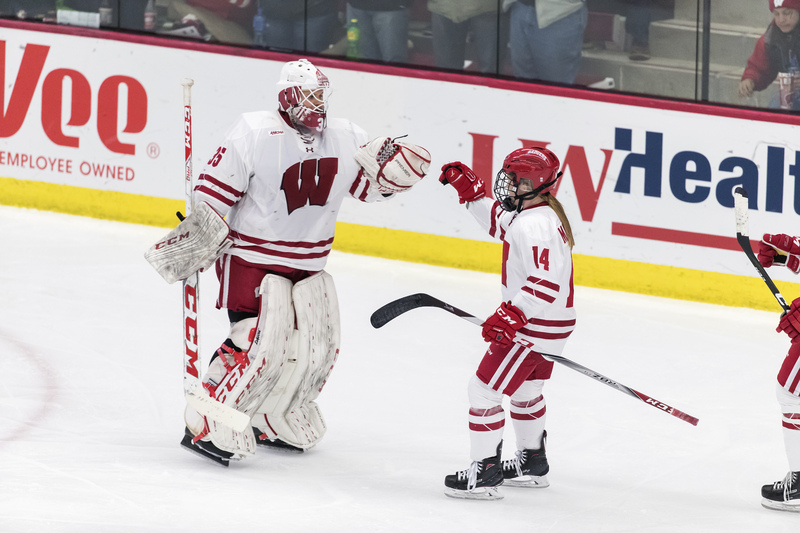 She backstops Wisconsin to 31 wins and takes them to the Frozen Four. She proves she can be a high-caliber goaltender and help her team compete for college hockey’s biggest prize. She’s ready to win a national championship. But the Badgers play Colgate in the national semifinals. They are locked in a 3-3 battle after 60 minutes. They play one overtime, and start a second. Eventually, Campbell can’t hold the Raiders off any longer. They score a goal, and send Wisconsin home. One year removed from the worst time of her life, Campbell battled all the way back, and finished just a game away from her dreams. After all of the struggles, the shift to a brand new team, the 31 wins in her first full season, you can’t shake the feeling that this isn’t how it was supposed to end. Campbell stays up all night after that loss, and over the next few days, she pours her heart into a 25-page journal reflecting on the season, and how it just ended. By the time she finishes, she’s already set her sights on the 2019 national championship game. She marks the date on her calendar. She sets a reminder in her phone. Every day when she wakes up and every night when she goes to sleep, she stares down a picture of People’s United Center, the site of the 2019 Frozen Four. She’s got no way of knowing how it will end this time, either, but she gets back to work to find out. As a junior, she’s named an All-American again in net. She helps backstop Wisconsin to 33 more wins, and the Badgers reach the Frozen Four. But it’s going to be different this time. Campbell already knows that. In terms of results, her junior year doesn’t seem too different from her sophomore year. But the consistency in her approach is miles beyond what it was last season. Still, there’s a ton of pressure going into the Frozen Four semifinal against Clarkson. 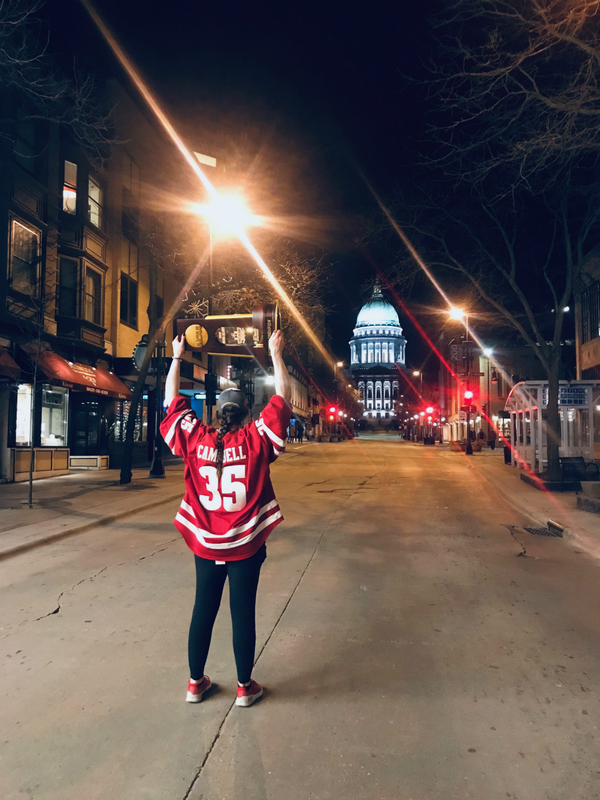 Campbell was not on the team then, but Wisconsin was shut out in the 2017 national championship game by the Golden Knights. They are two-time defending national champions, and their top line, led by Loren Gabel’s 40 goals, is formidable. But Campbell leaves no stone unturned in her preparation. She knows that stopping that line is going to be the key to winning the game. She watches clips of Gabel’s goals, studies her tendencies. When Gabel comes streaking down the wing on a 2-on-1 rush in the first period and fires a shot at Campbell, she snatches it out of the air and sets the tone for the rest of the game. Campbell and Wisconsin shut out the Golden Knights, 5-0, and advance to the national championship against Minnesota. It’s a curious thing, the line between winning and losing. One bounce could change everything. Or it could change nothing at all. Sometimes, you do everything the right way, you push as hard as you can, and you still don’t win. So there is really no way to map out how, exactly, you can become a champion. You can have a champion’s mindset. You can be consumed by hockey every minute of every day, dedicate yourself completely to your team and to your development, and that still might not be enough. You might still come up short. And the coming up short, the losing, the heartache—it feels like a setback. It feels like it’s chipping off a piece of your soul. How do you come back again after that? After all, you have no way of knowing if you’ll get a better result next game, or next season. You could pour your heart and soul into it again, do everything you can to be better, and still face the same hurt all over again. There is never a guarantee. And there never will be. The only way to know what will happen is to keep your head up and your eyes forward, and give it another ago. Maybe your team loses, or maybe you lose your team. You think it leaves you broken. You think there are pieces of yourself that you’ll never get back. But maybe, if you keep going, you can find them again. Even after the Badgers redeem themselves against Clarkson, and make it to the national championship game, they still don’t know if the ending will be any different. But they score one goal, and then another, and Campbell holds strong in net. Whenever the going gets tough, her and teammate Brette Pettet just remind each other of the two-by-four. They keep looking ahead. Eventually, there are only five seconds left in the title game, and Wisconsin is leading Minnesota 2-0. Like almost everything else, Campbell has a plan for this. Campbell becomes the first goaltender to ever shut out the entire NCAA Tournament. She’s named the tournament’s Most Outstanding Player. The plan is finally complete: she is a national champion. For such a historic performance to come after back-to-back years of pain and grief feels almost too scripted. Ultimately, though, it came down to Campbell’s own stubborn belief that nothing was going to get in the way this time. From the second Colgate found the back of the net in last year’s semifinal, her eyes never wavered from her ultimate goal. She decided, even in the face of what happens when it all goes to hell, to open herself back up to a world of hurt and go another round. It doesn’t end in brokenness this time. After the game, she says she feels like she’s been here before, because she’s pictured it in her head so many times. Everyone laughs. But she is dead serious. When she sheds her gear in that final moment, you can also see her shedding the weight of the last two years. Losing her first team, losing her first Frozen Four game, the gut-wrenching questions about what would happen next. It all goes flying, along with her stick and blocker and mask and glove and pads. There are pieces of her everywhere, strewn across the ice. Maybe this is how it was supposed to end. At some point, though, Campbell will pick up those scattered pieces of herself, and start again. I think that I expected to get this all right the first try. I expected to win a national championship this year. I expected to be the best team in the country. It was an expectation, but it didn’t end up being a reality. As I laid awake all night in my bed after the game I realized I didn’t have the same feeling as March 29th . There was no uncertainty–because I had a home. There was no stabbing anxiety–because I wasn’t broken. I was awake, because I was hungry. I was hungry to win–hungry for the next chance I would get to step on the ice, hungry because I knew this was not the end, it was only the beginning of the start of something that will be a legacy. I was awake because I believe that the best is yet to come. Kristen Campbell brings the national championship trophy home to Madison.